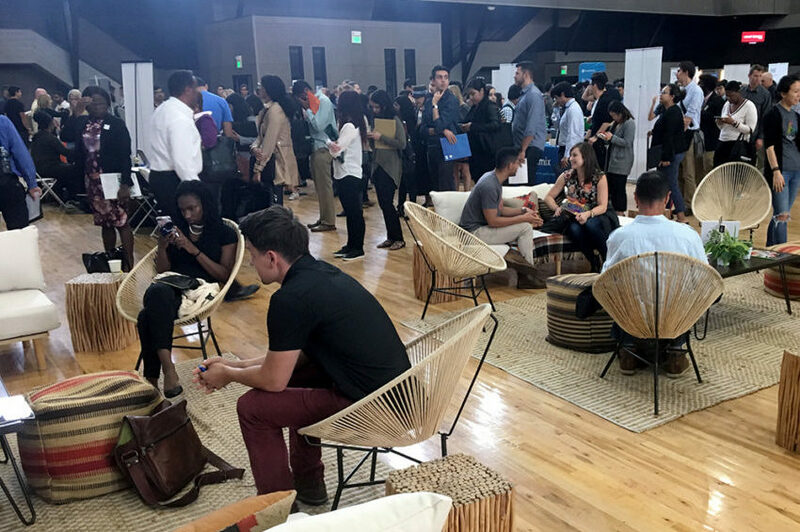 Candidates stood in long lines to chat with Airbnb in 2017. employees in this job-fair living room set up inside the Armory for the career fair at Tech Include. At 12 a.m. on Wednesday, Jan. 17, Kevin Guy became San Francisco’s pope of short-term rentals. Some 2,080 illegal Airbnb listings vanished into the ether in that very nanosecond. And they were, definitionally, illegal: As of that minute, a short-term rental host who proves he or she is following city laws and earns a license issued by Guy’s Office of Short-Term Rentals is legal, and a host who doesn’t have one is illegal and excommunicated — period. In the past, not having a license was no bar to renting out units and raking in cash — and hosts who flouted city rules aimed at preserving housing and were busted by Guy’s office would, within days or weeks, pop up on another hosting platform. “Whac-a-mole” is an overused analogy, but it seems remarkably fitting here. And, all the while, Airbnb, VRBO and the other platforms enabling this behavior were free to continue hosting proven scoundrels and rule-breakers, raking in their consequence-free cut. And, in this realm, there are plenty of those. Airbnb, which was born in San Francisco, rose to prominence via a business model that explicitly violated this city’s housing laws. It and other short-term rental platforms aided and abetted in the cannibalization of affordable residential stock at the very moment when this city is facing its greatest privation of that resource since, take your pick, the Gold Rush or the Big One of 1906. And yet, this company and its ilk — which, again, expressly violated city law and, again, devoured affordable housing far faster than this sclerotic city could build it — were coddled and shielded by Mayors Gavin Newsom and Ed Lee. For years, Airbnb failed to pay this city’s hotel taxes — and, when he labored to recoup that money, treasurer Jose Cisneros was actually told to back off by Lee (in writing!). The rules enacted in 2015 to validate Airbnb’s previously illegal business model and regulate its activity were so comically unenforceable that it well and truly appeared this was the intention all along. That sounds conspiratorial. But conspiratorial worldviews were rewarded when it came to describing this city’s relationship with disruptive startups — startups that just happen to be prized investment vehicles of the ascendent tech barons who’ve held such sway with the last several mayoral administrations. To wit: This city’s planning department in 2015 stated, unabashedly, that attempts to regulate Airbnb in any meaningful way would be hamstrung if it and other platforms were allowed to list unregistered hosts and proven scofflaws. And the Planning Commission agreed — until a mid-meeting text message from the mayor’s office to commissioner Christine Johnson led her to reverse her deciding vote. Three years later — three years of meticulous toil by the Office of Short-Term Rentals, three years of exploding valuations for Airbnb et al., three years of thousands of residential units sheltering tourists instead of residents — the city now has those powers. Your humble narrator has covered San Francisco government for the better part of 20 years, and rarely has he been able to write the following sentence: Things are moving in the right direction. TheOffice of Short-Term Rentals’ rejection rate for prospective registered hosts long hovered at around 15 or 20 percent. But, as last week’s mandatory registration deadline approached, the applications went through the roof. And so did the rejections. The office is now spiking nearly 40 percent of all applications. This city’s rules dictate that you must live on-site full-time to rent to tourists full-time. Otherwise, the limit for “unhosted” rentals is 90 days per year. An inability to prove residency is the No. 1 reason for prospective hosts to be bounced, and the skyrocketing rejection rate would seem to indicate that a goodly share of the former Airbnb (and other) hosts in this city weren’t the “grandma renting out the kids’ old rooms” types the company likes to promote, but more akin to ersatz hotels. When Masry gets these people on the phone, he often has lengthy discussions with them. “I tell them I’m trying to work with them sincerely and it’s clear they don’t live there. What drove them to giving us a fraudulent application?” Some people bluster with faux outrage but, increasingly, there’s another reaction. And it says a lot about perceptions of how things work in this city. Until recently, they would have been; honesty is often its own reward in this city. Consequence-free flouting of rules regarding short-term rentals was the plusher and more enabled San Francisco analog of consequence-free rampant property crime. It fosters the impression that we are living in a state of lawlessness in which government has abdicated its responsibilities. And it encourages a certain type of person people to step in and claim his or her pound of flesh, at others’ expense. San Francisco still has 99 problems. But, to a lesser extent, than it has been in years, Airbnb ain’t one. With some 6,000 illegal listings gone with a puff of white smoke, Guy’s office is feeling liberated — and enabled to look into bigger and more complex issues. They can monitor Airbnb’s new “Friendly Buildings” program in which apartment owners and building management companies enable subleasing and take their cut of tenants’ earnings. They can delve into whether residential hotels letting out rooms on short-term rental sites are violating myriad city rules. “Forced” is an apropos word. That’s because of a legal settlement won by the City Attorney’s office after Airbnb et al. sued over then-Supervisor David Campos’ 2016 legislation. Campos, for his part, describes this turn of events as “vindication.” Guy, who toiled for years at a Sisyphean task in an office many feared was mere window dressing before last week’s ascension, is less effusive. At a Jan. 17 hearing before the Board of Supervisors, he gamely presented troves of data off a PowerPoint and answered supes’ questions in a polite, bureaucratic monotone. A platoon of homesharing enthusiasts also testified, singing the praises of the new system. It remains to be seen just what this city will do. In the meantime, Airbnb and its acolytes seem to have come to the same realization as the Polish secret police colonel. Once able to more or less do as they pleased, the decision has now been made to kiss San Francisco’s you-know-what. This city has opted to let them. For now. Thanks for the great piece, Joe! Thank you, Joe E for keeping on this. Who would you consider the heroes here? I find it interesting how Airbnb is blamed for insane cost of living/housing in SF. Funny. Delusional, but funny. Great article! Good to hear a lot of details that the major paper doesn’t feel the need to include.